Hofstra Club Sports are back! Baseball, Men’s and Women’s Rugby, and Men’s Soccer pitched, scrummed, and kicked off the 2015 season with games across the weekend of September 12th and 13th. 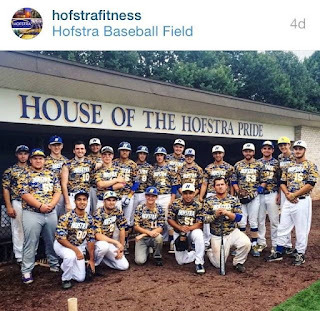 Hofstra Club Baseball picked up right where they left off from last season defeating Fordham University 14-2. The Pride, who finished one game short of making playoffs in the 2015 season, hit the ground running at University Field on the Hofstra Campus, putting up runs in bunches and registering some big hits courtesy of a strong returning class. Next on Hofstra’s hit list will be Westchester Community College, who the Pride will travel to for an 11:00am start on Saturday, September 19th. The Hofstra Club Baseball team before their game against Fordham University on Saturday, September 12th. 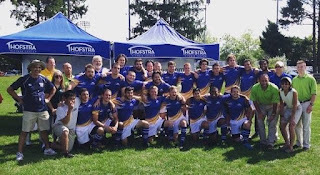 Hofstra Men’s Rugby Club enjoyed a historical Sunday that marked the start of an exciting partnership with Penn Mutual, who presented the team with new uniforms prior to their match up with Sacred Heart University on the Hofstra Intramural Rugby Field. The visiting team was a fitting foe for such a big occasion, as Sacred Heart finished second in the conference last year and is poised to dominate the league in 2015. The Pride, who have a roster of new players and are also under the guidance of new coach, Rory Forrestal, managed to put thirty-one points on the board, but in the end it wasn't enough, as Sacred Heart pulled out the 44-31 victory. Nevertheless, it was a memorable start to what should be the club's biggest year yet. The team will next be in action at Seton Hall on Sunday, September 20th. The Hofstra Men's Rugby Club poses for a picture after being presented with their new jerseys courtesy of Penn Mutual. Hofstra Women’s Rugby Club traveled up the New York State Thruway early Sunday morning to take on a tough Siena Saints side. Before the crowd had time to settle in, the Pride got on the board early as Nery Mendez scored her first try 30 seconds into the game. Recently named All-American Kim Tran added an additional three tries, Ashley Huber tacked on another, and Margaret O'Callahan made three kicks as the team rolled to a 31-12 victory. The team will open their home slate of games on Sunday, September 20th when they take on the University of Albany at 1:00pm at the Hofstra Intramural Rugby Field. Hofstra Men’s Club Soccer is looking forward to a promising 2015 campaign; the club has one of the highest numbers of players across all of our 29 club sports, and launched its season with a busy three game weekend. On Saturday, September 12th, the squad traveled to local rivals Fordham for its season opener, and fielded many new members playing together for the first time. The battle was clinched by the Rams in the last five minutes, ending the match 1-0, albeit with lots of positives for the Pride to take away. The team was back in action on Sunday morning, this time taking on neighboring Adelphi at Hofstra Soccer Stadium. This proved to be Hofstra’s first win of the season - and it was an emphatic one - Cassio Daros, Nick Brown, Rocky Famiglietti, and Jason Albert all netted to secure a 4-0 victory. With barely a minute to breathe, it was time to take on freshly rested Stony Brook, who beat the depleted Pride 5-0. The club will look to build on their (1-2) record when they visit Seton Hall on Sunday, September 20th.